I went upstairs back to D4 after gym and saw somebody setting up tripod with a Nikon DSLR. 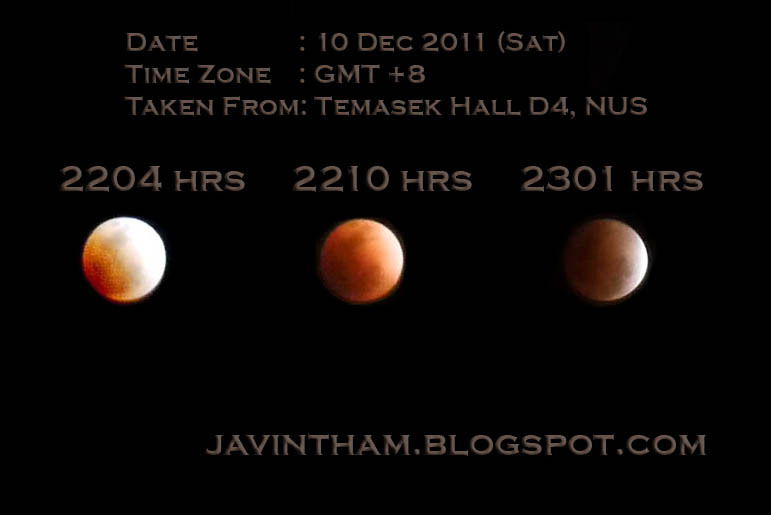 That guy told me that there'll be lunar eclipse tonight. Oh, wow, I think I've never seen lunar eclipse before, so I'm gonna take some shots after bathing. I actually felt pretty embarrassed setting up my cheap tripod with my Lumix GF3 on, with a 14-42mm lens, compared to that guy's 70-300mm lens. Apparently, his is able to shoot things from a further distance (anyway, it's hall's camera and lens, I heard). With my not-very-professional camera and photo shooting skill, it took me quite some brain juice to figure out the best mode to shoot the moon. You know, the sky is black and the surrounding is dark - not as easy as shooting a typical photo. And from quite a lot of photos, I just chose three of them that are relatively presentable (in fact, lousy) and clear (still, blur). The eclipse was said to occur at 9:30pm, I personally observed that the recovery started at 11pm - that made me sat so long at the D4 balcony. The moon turns red or brown during a total eclipse because apart from the shadow of Earth on the moon, the sun filters through the Earth's atmosphere (air, dust) onto the moon's surface as well. Source: Why does the moon look red during a total lunar eclipse? I'm lucky enough to observe one in Singapore and the next one, perhaps a decade later?